Jimmy Sue Caldwell and her husband Thomas remember Aug. 11, 2014 all too well. The longtime Detroit residents were home on Ward Street. Outside, a once-in-a-lifetime storm was lashing their northwest neighborhood with rain for hours. They would soon find out this wasn’t just a bad storm. It was a historic one. As they sat on a couch in their tidy, finished basement, Jimmy Sue felt a strange sensation on her feet. She looked down to see water covering the carpeted floor and rising fast. They retreated up the stairs, but within minutes the murky, smelly water was almost knee deep and just about everything in the basement was saturated with the sewage-laced storm water rising through the drain. When the storm finally passed, much of metro Detroit was under water, with more than 100,000 homes flooded in Oakland, Macomb and Wayne counties. Detroit, where the infrastructure is oldest and least capable of handling such a torrential rainfall, had been struck by the largest natural disaster in the United States in 2014, according to the Federal Emergency Management Agency (FEMA) and American Red Cross. With today’s two-year anniversary, the storm is just a memory for most people. But not in Detroit, where government at all levels has essentially moved on from the poorest of flood victims. According to disaster relief agencies, from volunteer groups to the American Red Cross, thousands of mostly lower-income Detroiters, including those not previously counted by the government still live in damaged homes, with families exposed to toxic molds that can cause asthma and chronic disease. Some have now gone through two winters without working furnaces or water heater tanks. Two years later, there are flood-damaged homes that haven’t even been visited by government agencies or relief organizations. In some cases, it’s because the people living there were renters, not homeowners. In others, FEMA staff said they were told by the state to avoid walking Detroit’s streets because the city was too dangerous for door-to-door canvassing. Relief agencies told Bridge that still other families received only a portion of the disaster funds needed to repair flood damage, and were too poor to make up the difference. 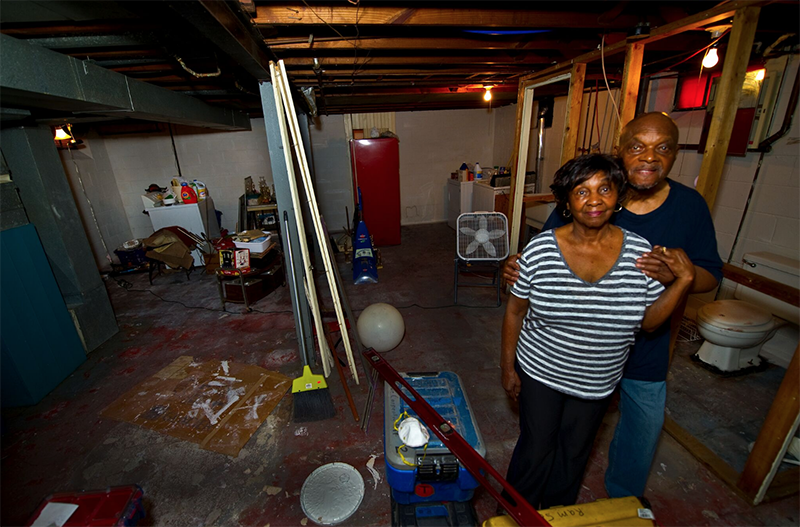 The Caldwells were fortunate their furnace and other appliances still functioned after the storm but, like many Detroiters impacted by the storm, they couldn’t afford to properly remediate their basement. For more information on the Northwest Detroit Flood Recovery Project, including how you can help, call 313.646.4052 or send an email to nwdfloodrecovery@gmail.com. The group is also on Facebook. NwDFRP says you can send the group donations by sending a check to The Detroit Annual Conference Treasury Office, 1309 N. Ballenger Hwy. Suite 1, Flint, MI 48504. Memo Line: NW Detroit Flood Recovery (The group said 100 percent of all donations go to direct assistance). The recovery process has been as murky and frustrating for many Detroit residents as the water that filled their basements. FEMA doesn’t give assistance for most basement damage. The city of Detroit helped residents apply for disaster aid but did not pitch in funds because, it says, the flooding was not the city’s fault. The state, meanwhile, says it gave $8 million two years ago. Fortunately there have been a number of locally-based organizations that have stepped in to help. Yet for all their work, they are few and the need remains substantial. Metro Detroit was pummeled that day by a deluge not seen in most people’s lifetime. By the time the rain subsided, 4.57 inches had fallen at Metro Airport, the second highest total ever recorded in a single day. Some areas, including Detroit, recorded more than six inches of rain in less than 12 hours which, by National Oceanic and Atmospheric Administration (NOAA) standards, is a once every 500 year storm. Roads and major highways flooded, forcing drivers to abandon vehicles. Michigan State Police sent divers into the dirty waters that filled highway underpasses to ensure cars were unoccupied. The region’s inadequate infrastructure resulted in nearly 10 billion gallons of sewer overflows – into creeks, rivers and basements. By some estimates, the Tri-County area suffered more than $1 billion in property damages. National attention to Detroit’s plight proved fleeting. Actor Robin Williams committed suicide that same day and, two days earlier, a white police officer in Ferguson, Mo., killed a black teen, Michael Brown, triggering civil unrest that would hold the media’s attention through the fall. As a result, few outside Michigan realized the damage left in the wake of the storm. It took Gov. Rick Snyder more than a month to ask the federal government to declare a major disaster for the three counties most impacted by the storm. State officials say the delay was due to the time needed to document the need for federal aid. “The state of Michigan had to make a case to the federal government that presidential disaster declaration assistance was needed due to local and state resources being overwhelmed,” said Ron Leix, public information officer for the Emergency Management and Homeland Security Division of the Michigan State Police. “With up to 4 million residents affected in southeast Michigan — which encompasses Oakland, Macomb, Oakland and Wayne counties — and limited resources available to directly address uninsured private property damages, a thorough damage assessment was needed to make a case to FEMA and President Obama that federal assistance was required to help communities and individuals recover from the flooding disaster. “Basement flooding is generally not covered by insurance policies unless there is a rider on the policy,” Leix added. After receiving the formal request, President Obama declared a disaster, allowing storm victims to seek federal assistance from FEMA. Over the next couple months, FEMA received more than 130,000 applications for disaster assistance in the three counties. As of July 15, the federal agency reported it had approved a little more than half of those requests, a total of 73,411, doling out around $300 million in federal assistance through various programs. That’s an average payment of over $4,000, but in many cases the awards were just a couple hundred dollars, according to local disaster aid organizations. For the Caldwells and many of their neighbors, the federal aid didn’t come close to covering the costs of cleaning up the mess that was left behind. Carmen Middleton, who lives across the street from the Caldwells on Ward Street, said her basement was flooded with about 18 inches of water, destroying carpet, walls, furniture and just about everything else. She said FEMA awarded her $600. “That’s what I had to pay just to get the water out of the basement,” said Middleton, noting it was the first time her basement had flooded in the 37 years she has lived there. According to FEMA officials, floodwater or sewer backup damages in recreation rooms, unoccupied basements or storage spaces generally do not qualify for FEMA assistance. However, disaster-related damages to a home’s mechanical components or those in areas that meet the federal definition of essential living space — regardless of the location in the home — may be considered eligible. A 2015 report by the U.S. Office of Inspector General concluded that FEMA “responded effectively” to the storm ‒ especially in coordinating with state and local officials. But it also noted a striking limitation. The report does not say how FEMA was able to determine the number of damaged homes in Detroit without door-to-door visits, or if the agency relied on what homes looked like as they drove by to determine if there may be water damage inside. Asked about the report, Leix, the spokesperson for the state’s emergency management office, acknowledged Wednesday that his office warned FEMA to avoid door-to-door interviews in Detroit. But Leix added that the state's safety warning was for the entire region, not just Detroit, contrary to what the report said. Leix said there were a couple of “incidents” during FEMA’s subsequent investigation of flood damage, including one instance that involved a firearm. Outside of the limited help Detroiters say they received from FEMA, homeowners like Middleton and the Caldwells didn’t know where else to turn. The City of Detroit, which was in the midst of its historic bankruptcy, helped set up three Disaster Survival Assistance Centers, where they worked with residents to apply for federal aid. But the city did not pitch in funds to help residents. Bryan Peckinpaugh, public affairs manager at the Detroit Water and Sewerage Department, said the city wasn’t legally responsible for the basement backups because they were not the result of a malfunction in the system. The storm was beyond the system’s capacity. “Typically if there was a failure of the system, residents might be able to make claims with the city. But in this case, the system was overwhelmed. That means, under state law, the city is not responsible to reimburse residents for their damages,” Peckinpaugh said. As for Michigan, Leix, of the state emergency management office, said in the immediate aftermath of the storm the State Emergency Operations Center was activated and resources were provided to local communities. He noted though that in Michigan emergencies and disasters are administered by local governments. As for financial aid, Leix said the state contributed money in conjunction with the federal aid. “As a part of the presidential declaration, the state of Michigan split some of the assistance costs with the federal government," Leix said. "In the ‘Other Needs Assistance’ provision of the Individuals and Households Program, the state of Michigan contributed nearly $8 million of the $32 million in assistance provided to southeast Michigan disaster survivors as a part of a 75-percent federal and 25-percent state cost sharing agreement." The grants, he said, covered uninsured, disaster‐related necessary expenses and serious needs, including damage to clothing, vehicles, household furnishings and appliances, education materials, clean-up machinery and moving costs. It simply wasn’t enough in Detroit, the nation’s poorest big city. In stepped organizations known for disaster response management, including the American Red Cross, and a variety of faith-based groups. As the name suggests, the group is focused on the northwest section of the city – the area west of Woodward and north of Warren Road, and where there were more than 44,000 damage claims submitted to FEMA after the flooding, according to Rebecca Wilson, the project coordinator. “Detroit had never seen a disaster like this, and just wasn’t prepared,” Wilson said. “The United Methodist Church wasn’t prepared, either. We had dealt with small tornadoes, but nothing like this. This was the largest natural disaster of 2014 and nobody was prepared for what that meant. Wilson said the number of people in northwest Detroit still living in homes with damaged basements is staggering. One of the biggest challenges for the group – and there are many – is finding unknown victims who are still out there. Wilson’s skeletal team includes managers Cheryl Tipton and Linda Staley, and an office intern. The project is funded primarily by UMCOR, which pays for disaster relief around the globe. NwDFRP team members say they have visited nearly 500 homes. During interviews, they assess the damage, determine what needs the people still have, and find out if they applied for FEMA assistance. If they were denied, they look for reasons to appeal the decision. Unfortunately, the group can only help homeowners not renters – and they must be current on their property taxes. They say they want to ensure limited resources go to people who will actually benefit from them. To date, the group has assigned case managers to about 200 homes where they offer direct assistance, which often means “mucking out” basements. Those molds can be dangerous and even toxic, dramatically increasing the risk of allergies and asthma. Carmen Middleton’s situation is a perfect example. When NwDFRP managers visited, they found yellow, black and white mold throughout the basement. Dressed in HAZMAT suits, volunteers working for the NwDFRP rip out wet carpet, moldy walls, and whatever else remains in the basements. Rarely is there anything salvageable. They then disinfect and drylock the foundation walls, rebuild interior walls (if there had been any), fix tile work, then paint. They hire local contractors to repair plumbing or electrical damage, replace furnaces or remove asbestos tiles. As of mid-July, they still had about 70 open cases that need muck-outs or are in various states of repair. That number rises daily. “The actual number of people who still need help, I don’t even know how to guess. I have no hesitation saying it’s in the thousands,” Wilson said. Fortunately for NwDFRP and the Mennonite Disaster Service, which runs a similar but smaller assistance operation in the Osborn neighborhood on the city’s eastside, most of the labor is by volunteers from all over the country. As a result, there is usually no direct cost for the muck-outs. But the relief agencies spend funds for new furnaces, boilers, water heater tanks and construction materials needed to rebuild basements. They say they are getting the materials at cost from local dealers, and a number of contractors do plumbing, electrical and heating work fairly cheap. One of the positive aspects of the damage has been the mix of people working to help flood victims. Among them is NECHAMA from Minnesota, a Jewish nonprofit that responds to natural disasters across the country. It was one of the first to respond in Detroit, arriving within 24 hours. Its volunteers spent the next six months mucking out about 300 homes. Since the initial response, NECHAMA volunteers have been back twice, most recently this July with a group of 30, doing muck-outs and restoring basements for the Northwest Detroit Flood Recovery Project. Volunteers say the hard work is worth it when they see the expressions of joy from the people they’ve helped. People like Regina Manuel. She has lived in the same home on Hubbell Street for 50 years. Like many, she used her basement as living space. She even had a play room set up for her grandchildren. After the flooding, it had been off limits for nearly two years. “This has been such a blessing for me and my family. My grandchildren can go down there again. It’s like a whole new home,” Manuel said. Far too many Detroiters, however, aren’t as fortunate as Manuel because they don’t know where to turn. And, unfortunately, one of the only places – the Northwest Detroit Flood Recovery Project – may not be around much longer. According to Wilson, its UMCOR funding is set to expire at year’s end, with so much still to do. Fortunately for Jimmy Sue and Thomas Caldwell, NwDFRP reached them. Volunteers mucked out and gutted their basement in July and were expected to be done with the rebuild well in advance of the two-year anniversary. Kurt Kuban is a longtime journalist who focuses on environmental issues. He is editor of the Community Publishing group. Our home in Wisconsin flooded in 2000. A valve at the sewage treatment plant failed after three days of steady rain had saturated the soil and caused high storm flows. I was alone--our daughter was in college and my husband was deployed overseas with the Army Reserve. I tried to bail my basement as the water rose with two empty 5 pound pails that had contained drywall joint compound. I ran up the stairs and dumped these buckets until I ran out of every ounce of energy I had and I fell down flat. I went back inside and watched the water rise. It took out our heating boiler and hot water heater. Our homeowners insurance paid for the appliances, but the cleanup was entirely my responsibility. I think maybe there was some govt. assistance, but we weren't eligible. When floods hit, you really see how much you are on your own. My heart goes out to the people of Detroit who are still living with the aftermath of flood. We desperately need volunteers to help in this ongoing crisis. Please contact the numbers and links in the article to volunteer. Thank you Bridge Magazine for this article. Unfortnately Erwin, most people in this age in many communities have been conditioned to only look for the state to be the provider of all things. We've damaged and neglected all other institutions, personal initiative,connections and relationships to the point where with few exceptions we've become helpless in the face of adversity other than whinning for politiicans and the government to help. It only looks to get worse. De Toqueville would never recognise us. Matt, your rhetoric is old and outdated. It would be wise for you to volunteer for one of these groups and see the reality of what is going on in these homes in Detroit, because I have. Since this flood happened there have been volunteers from all over the world that came to help. Anyone on the ground seeing the reality of what these Detroiters are dealing with daily aptly describe it as "gut wrenching". We are talking about "our neighbors". We are talking about another human being who is suffering. I don't know what has made you so hard hearted? I am sure your response will be the same old "progressive liberal" rhetoric. I am just one human being who cares for my neighbor, and try to live by the golden rule! So Bernadette, the almost total disintegration of families/fathers in communities like Detroit has nothing to do with situation of helplessness in the face of such problems? Interestingly we can see the same pattern in New Orleans vs. adjacent Mississippi after Katrina, one community bounced back, the other is still struggling even after years and large amounts of Federal aid. Not that charity doesn't have a place in helping those struggling but do it wrong and we end up with our own version of Haiti. This might be old thinking but not it's not outdated. It is callous, and subliminally racist, to blame the victims. Shame! In this time of global change, we have to change the way our property insurance works. I have no idea of "who" could make this change, but we MUST make insurance companies cover floods, mudslides, etc. So, we all pay a couple of buck extra per month. It would be worth it. That's the Government. I suspect that these people will continue to vote Progressive Liberal Democrat. Ironically, I am on break between clean up of our own basement from the flooding from the rains from last night as I read this. Our local municipality also claimed 'no fault' for the 2014 flooding, as did the neighboring community whom we share a pumping station with. Check your homeowner's policy carefully. Sewage back up (which is what our flooding came from) is a separate rider, and you can only get flood insurance when you live in a flood zone, and then coverage only comes through when the water comes in a basement window or dryer opening. We were not eligible for any of the FEMA funds and had to clean out the mess ourselves then, and again in July of this year when the pumping station again failed after getting 3 inches of rain in about an hour....and well as today as I sop up rainwater that the ground can no longer contain that has come in from a foundation that has already been waterproofed by the previous homeowner which somehow was supposed to have a lifetime guarantee that did not transfer with ownership change. When you look at the greater picture, it seems to be more of an infrastructure issue than a problem to be born by the frustrated homeowners alone. All the loopholes and riders that the insurance companies have function in such a manner that their purpose is to pay the least amount possible after denying as many claims as possible. If we could find a way to fix it right, maybe this would not keep happening. Our home insurance system NEVER seems to pay out claims, no matter WHAT happens. The State Insurance Commissioner should mandate for EVERY policy that if the home is in a State and/or Federal disaster zone, that ALL costs from ANY damage are paid for. This was a once-in-500-year flood, yet insurance won't cover the claims? Why even bother to get insurance? Flood insurance isn't available? It's not a flood zone, okay, so the policy should cover such a freak disaster then!